As the days become longer, spring is slowly beginning to show its telltale signs across the Pacific Northwest. And while we may be biased, it’s clear that Washington, with majestic mountains, rushing rivers, city lights and Pacific Ocean beaches, is one of the nation’s most gorgeous states. Unfortunately, even with such stunning landscapes, people still choose to throw their leftover meals or abandoned mattresses on the side of our highways. Many of you have expressed concerns about the litter you are seeing along our highways, especially around this time of year. It saddens us as well, and we agree that litter greatly diminishes the natural beauty of our Evergreen State. We spend more than $4 million annually to help clean our roadways but, sadly, even with such a large expenditure we’ve seen roadside trash increase for the past several years. In early spring it’s particularly noticeable because our recent work has focused on snow and ice removal and emergency repairs. That’s why we need everyone’s help to keep our roadways clean. Adopt-A-Highway volunteers pick up roadside litter alongside I-5 in the Seattle area. We get complaints about some state highways more than others, but roadside litter is a statewide problem. In Seattle and Bellevue, I-5 is often where the most trash accumulates and where we get the most complaints. The high traffic amounts contribute to this, as do the growing homeless encampments in the area. Further south, we see a lot of complaints about SR 410 in Bonney Lake. State Route 16 on both sides of the Tacoma Narrows Bridge is another hotspot along with sections of I-5 near the Tacoma Mall. We try to respond to litter complaints promptly, but other maintenance needs – such as guardrail or pothole repair, emergency bridge or road repairs or preventative maintenance – are higher priorities. Simply put, limited state funds and a long maintenance “to do” list, means litter clean up often falls to the bottom of the list. Our maintenance crews pick up litter as time and resources allow. Our crews also pick up bags that other groups – Adopt-A-Highway, Ecology Youth Corps, etc. – gather and leave on the side of a highway. We know litter is a far-reaching concern. That is why we must work with our partners – local government, businesses, law enforcement and the public -- to help get the job done together. This includes sharing clean up responsibilities and working to raise awareness to prevent litter from happening in the first place. One easy way to do this is by properly covering and tying down your loads before you hit the road – even on “just short trips” through town. It not only helps prevent litter, it’s also the law. Please also spread the word to friends, family and neighbors. Preventing trash from reaching roadways is the best and simplest way to reduce roadside trash. We have collaborated with the Department of Corrections for several years to assist with roadside litter and other cleanup efforts on state rights of way. Their work crews are an invaluable addition to our overall efforts. In addition to DOC crews, in some locations, local county jail crews are also used for site cleanups. While they are an important resource, it’s important to note that the work crews cannot solve our litter problem single-handedly. 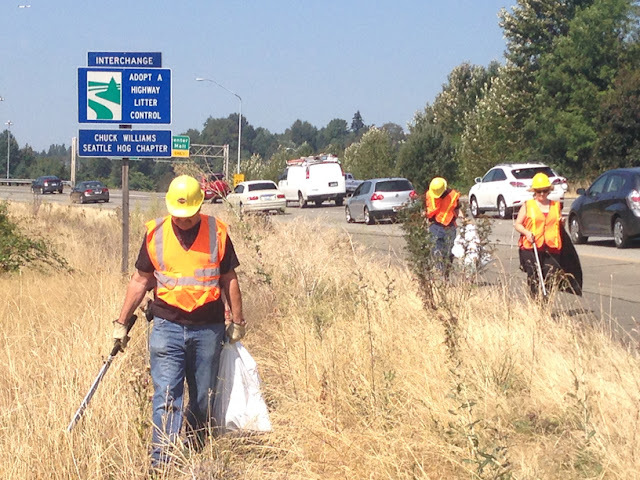 We’re always looking for more people to join our Adopt-A-Highway program where volunteers or corporations help clean a set section of roadway. We know the work is not glamorous, but it is invaluable and participants know they’re doing something tangible in their own backyard to help their community. (We provide supplies and safety training to interested groups). In 2016, we had nearly 1,400 volunteers and 300 sponsored contractors assist in removing litter on state highways. This equates to more than 20,000 bags of litter picked up and disposed of by our maintenance crews with approximately 4,341 miles of highway adopted. on their Adopt-A-Highway route along US 101 in Clallam County. Volunteers from left to right: Glen King, Elbert Hampton, Gary Slyter and Bill Plumley. Even with such valiant efforts, the litter remains. Currently, only one-third of our roads are adopted. You can learn more about our Adopt-A-Highway program and sign up to adopt a particular roadway online. Applications for summer Ecology Youth Corps also are being accepted by our partners, with details available on the Ecology website. We know our residents take our state’s beauty seriously – as they should. We hope that by working together, we can all make a difference and keep litter off our roads. Is so sad to see how much trash there is on our freeways Washington is a beautiful state and I hat to see this especially when summer is approaching and we have travelers from other states passing through and seeing this. Where does our tax money goes? I too am terribly bothered by the amount of litter I'm seeing right now. It's such an eyesore for our community and I worry about the impacts on wildlife as well. I've called in my complaint (405, Kirkland area). I appreciate this blog post explaining funding issues. I'm hoping WSDOT will continue to look for creative solutions to litter cleanup and approach legislators to fund it. In the meantime I'm looking into adopting a section of highway. We agree with you that litter diminishes the beauty of our beautiful state. Like we shared in the blog post, WSDOT spends nearly $4 million annually on litter, however even with such a large expenditure we’ve seen roadside trash increase over the years. Our maintenance crews pick up litter as time and resources allow. We try to respond to litter complaints promptly, but other maintenance needs – such as guardrail or pothole repair, emergency bridge or road repairs or preventative maintenance – are higher priorities. We know litter is a far-reaching concern. That is why we must work with our partners – local government, businesses, law enforcement and the public -- to help get the job done together. This includes sharing clean up responsibilities and working to raise awareness to prevent litter from happening in the first place. More information about our Adopt-A-Highway program is available online. My personal experience from living in Kitsap County for 20 years is that a large amount of litter comes from the uncovered Waste Management trucks as they move about our roads picking up recycling and garbage. Perhaps the contracts that counties maintain with garbage/recycling companies need to be addressed? I find the on and off ramps to be some of the worst - I-5/I-405 is very bad but nearly every on/off ramp seems to be an excuse for folks to empty their vehicle trash. Eastgate is very bad and even Issaquah. It's the medians as well as the sides. WSDOT currently does not contract with local refuse companies to remove litter on state highways. We do however contract with both Department of Ecology and Department of Corrections like we mentioned in the blog post to clean up highways and remind all motorists to secure their loads before heading out to prevent further trash from falling out and littering our roads. Hey 410 and south 167 looks like crap ! Who is getting paid that is suppose to be cleaning this up ? The issue of the trash companies is very real but I think most of this is coming from irresponsible passengers and drivers tossing out garbage and leaving unwanted items. In Seattle I make a point of picking up trash when I visit. However, there the city has stupidly removed hundreds of trash bins. We appreciate you doing your part to be part of the solution. Thank you! I90 eastbound from Spokane is awful; by far worse than it has ever been. IT IS A FRIGGIN MESS. We are sick of too many of our tax dollars going to improve the west side ... why is there so much concern for a stupid straw and none for this trash. It is way past the time for WSDOT to hire people for cleanup. Where do out tax dollars go. IT IS A DAMN EMBARRASMENT!! Driving from Everett to Oregon via I-5 on a regular basis, I must say that I-5 to the Oregon state line looks trashed compare to I-5 in Oregon. I see most of the trash flying out of pick up truck beds that have left over plastic bags, plastic cups, plastic bottles etc. in there that fly out. Oregon's so called "bottle law" helps a lot in the amount of litter along the highways and it is a day and night difference between here and Oregon. Also when the WSDOT says it is too busy with snow and ice removal in the winter doesn't this come with sanding? Why is there almost no sweeping done on our highways, especially on and off ramps. We had several weeks now with nice weather and sand/gravel is still all over the place and I get hit by rocks daily. Why are these snow plow drivers not out on mass, as with a snow event, to sweep these roads. This is litter also in my view, created by WSDOT themselves. Thanks for reading. I hope to see some action. I agree with the last two posters and yes I think that WSDOT should be relying less on companies sponsoring roads and more on an official budget. I can't comment on Spokane as I don't live there but I can certainly imagine the problem and sympathize with the priorities argument the poster. On and off-ramps to freeways on the West side and medians are not problems and obviously some freeways are worse than others with the I5 through Seattle, the 405, and I90 being very bad. So too are the approaches into SeaTac. These are all priority roads and Yes, I would also include roads through Spokane based on what the poster above was saying. Do folks actually open their windows and Chuck their stuff out or is it the Waste Companies? Any data on this? Thank you for your comments. We certainly hope people are not simply chucking their leftovers out the windows, but most of the litter we have observed is from unsecured loads. Thanks WSDOT, I should have edited my last post! On and off-ramps to our area highways and the medians ARE problem trash areas and I hate the deliberately placed bags, mattresses. We need to recognize that trash begets more trash until it becomes almost an insurmountable problem by its very largeness. We do not want to get to that point which is why graffiti and trash patrols are essential to keeping our freeways clean. I am now picking up at least one item of trash each time I visit Seattle and dedicate it to WSDOT's core mission of keeping roadways clean but I can't logistically get out of my car each time I see freeway trash and I don't think WSDOT wants us to. I have noticed whatcom county is atrocious with litter along I-5 from Blaine to Bellingham. Also today I was driving West from Easton near Snoqualmie pass and there is so much litter! Like a load ripped open and spewed it all over the median. Please please please do something! All I see is Seattle area complaints and a couple Spokane, but come down to Vancouver along I-205 at the newish Mill Plain Blvd exit (that mile long one) and it looks like it leads to the dump instead of this major street. It is embarrassing to me, and I would go out and collect it myself if I could. New pavement, sidewalks and culverts, oh my!